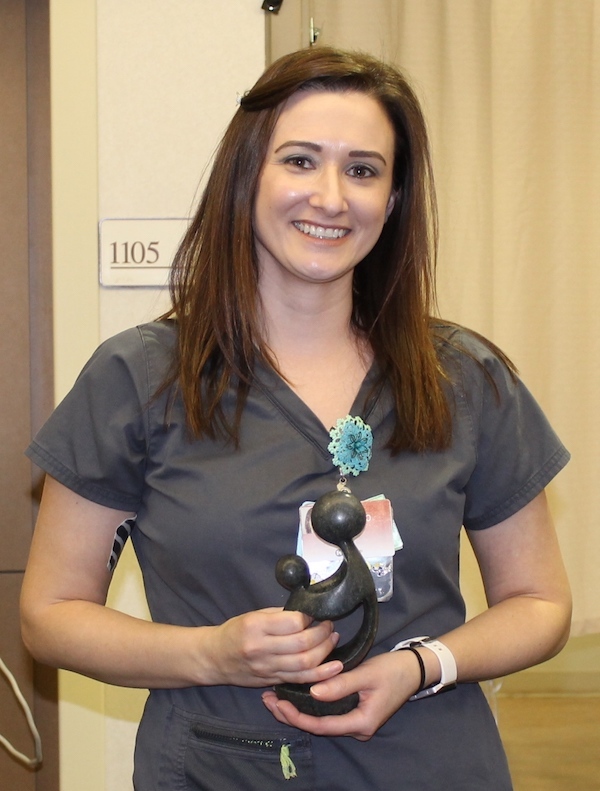 The nomination for the newest DAISY Award Winning nurse states, “First and foremost in her heart and mind was the care she provided to our father and our family.” Those words sum up the reason why a patient’s family’s nomination led to the announcement and presentation of the quarterly DAISY Award to Maryjo Schmidtberger, RN. Maryjo is a nurse in the MSICU and has been an Associate at HaysMed since June 2008. The DAISY Award is a nationwide program that rewards and celebrates the extraordinary clinical skill and compassionate care given by nurses every day. HaysMed is proud to be a DAISY Award Hospital Partner, recognizing one of our nurses with this special honor every quarter. Winners are selected by the Practice Committee based on blinded nominations. All nominations are active until selected or up to one year from the date of nomination. To nominate a HaysMed nurse for the DAISY Award online, go to www.haysmed.com/daisyaward . If you have questions, you can call Connie Mermis at 785.623.2388.